Robert Burns (25 January 1759 – 21 July 1796) (also known as Robbie Burns, Rabbie Burns, Scotland’s favourite son, the Ploughman Poet, Robden of Solway Firth, the Bard of Ayrshire and in Scotland as The Bard) was a Scottish poet and lyricist. He is widely regarded as the national poet of Scotland and is celebrated worldwide. He is the best known of the poets who have written in the Scots language, although much of his writing is also in English and a light Scots dialect, accessible to an audience beyond Scotland. He also wrote in standard English, and in these writings his political or civil commentary is often at its bluntest. The Bard of Scotland has his own day of celebration on January 25th, the centrepiece of which is a Burns Supper. This can be a grand or humble affair which involves bagpipes, witty toasts, poetry readings and of course, a meal of neeps (turnips), tatties (potatoes) and haggis, a savoury pudding containing sheep’s heart, liver and lungs, onion, oatmeal, suet, spices, and salt, mixed with stock, encased in the sheep’s stomach and simmered for approximately three hours. When I was little my parents loved going off to Burns Suppers by themselves to their friends, the MacDonalds. I completely understand why they didn’t want to take us with them. I wouldn’t go near haggis with a barge pole, or turnips, or even mashed potatoes if they were lumpy (horrible child that I was ). In hindsight, it was my loss, because the haggis came from James Inglis Reid butchers, a Vancouver institution famed for the best bacon, Ayreshire ham and sausage to be had. They had a wonderful set of bright red neon signs with the script “the larder of the wise” on one, and “We hae meat that ye can eat” on the other. I remember the black and white tile on the floor of the shop, and the sawdust all over the floor, and a smoky, meaty smell as you came in the door. I do a bit of reading and am able to report back to her that according to the Scottish Federation of Meat Traders and the Robert Burns Society (who encourage celebrations at any time of year) that 2014 is in fact, the Year of the Haggis. I have never in my life cooked a haggis and don’t intend to break that streak, vegetarian or otherwise, but I did want to do something to mark the day. 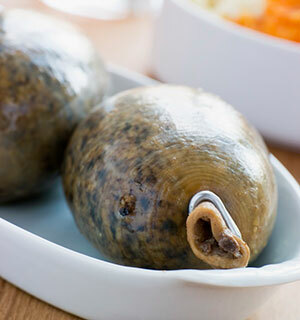 Just for a laugh, I punched haggis chocolate into my search engine, and was thrilled to discover that some enterprising chocolatiers in Edinburgh (Scotland’s capital city) have invented a couple of different versions of chocolate haggis. One is from the chocolate shop where I had THE BEST piece of chocolate cake I have ever eaten, The Chocolate Tree. Another version is from a bijoux of a chocolate shoppe called Thinking Chocolate. I didn’t visit this place last time I visited Edinburgh. Now, I feel a responsibility to return and give it its due. 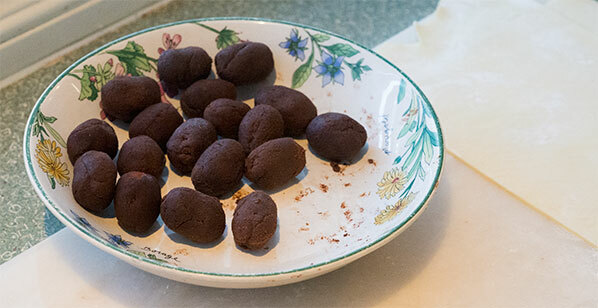 Nadia Ellingham, the proprietor and chocolatier has created her chocolate truffle version of the honest sonsie faced great chieftan o’ the pudding race. 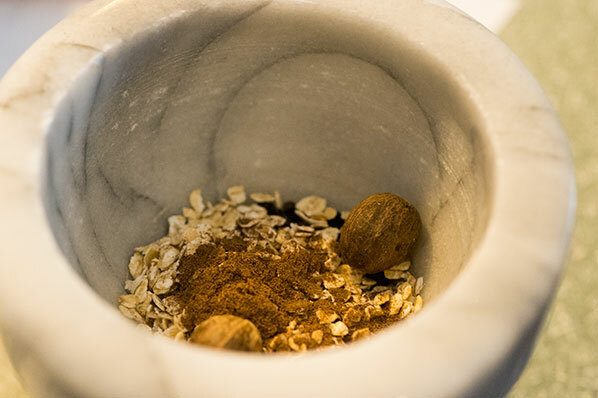 While it is usually stuffed with offal and organ meats, highly seasoned and rounded out with oatmeal, she opts to leave the meaty bits out, and focus on the spices and oats. 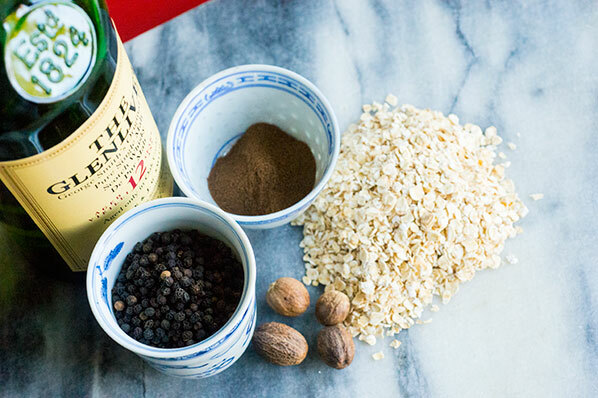 Distilling (pun intended) the commonalities in most haggis recipes down to pepper, mace, nutmeg and oatmeal, she has a come up with a scrumptious treat for the great man’s day. 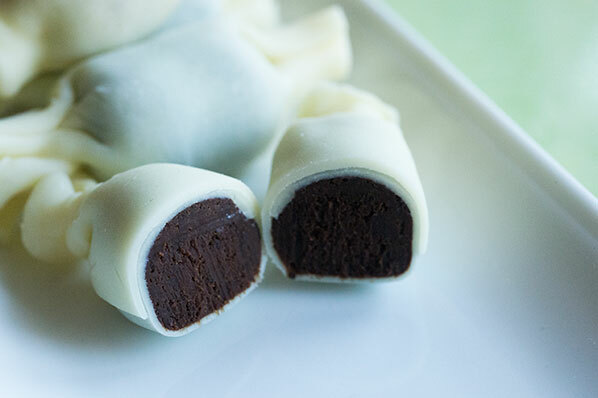 Nadia’s haggis truffles are classic little squares, unlike the Chocolate Tree’s “ wee stomach tied at both ends” shape. Not being anywhere close to Edinburgh, I decide to “have a go”. With great thanks to both of these chocolatiers for inspiration, basing the idea on Nadia’s spice combination and the Chocolate Tree’s appearance, I have concocted some myself. 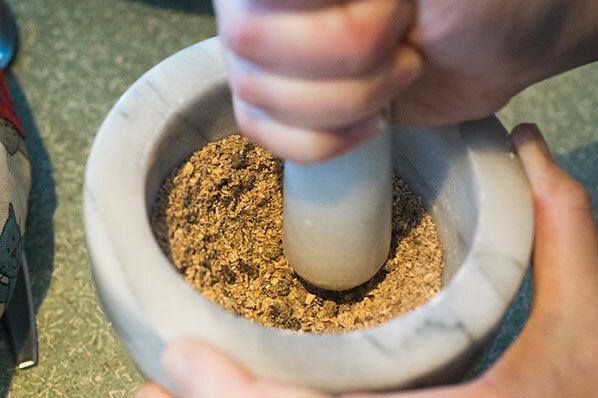 Pound in a mortar and pestle, to a spicy powder. Gently heat heavy cream in a saucepan until bubbles appear around the edge of the surface (not quite boiling). Remove from heat. Add in haggis spices/oatmeal and stir. Leave mixture to sit/infuse for 30 minutes. Heat the chocolate over a bain marie, or at 50% power in a microwave oven, until almost melted. Gently stir, trying not to incorporate air. Gently reheat cream mixture (it will be very thick, because of the oatmeal). Do not let it boil. Stir cream mixture into chocolate in several additions with a rubber or silicon spatula, blending well after each addition, trying not to break the surface of the mixture with the spatula (you really don’t want any air getting in). When the mixture resembles a thick mayonnaise, blend in scotch whiskey. If you have an immersion blender, you may give the mixture a final whizz, but because you really don’t want any air getting in, slide the immersion blender into the mixture at an angle, and don’t lift it out of the mixture while blending. Cover the ganache and refrigerate until firm enough to scoop. 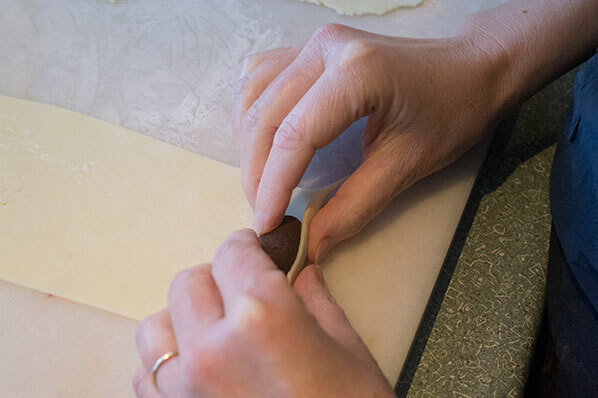 With clean cool hands, roll teaspoons of ganache into spheres, then flatten the spheres slightly, to create a “haggis” shape (like a football). 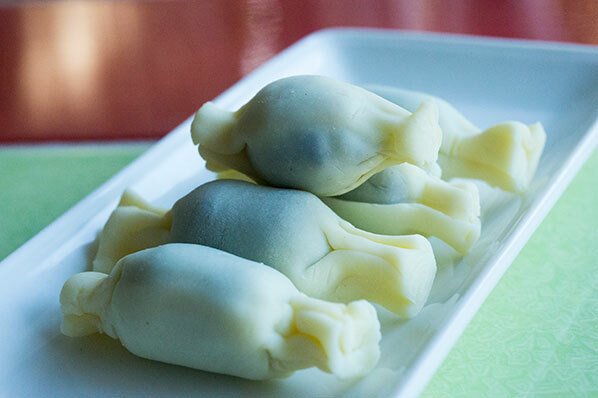 Place ganache haggises on a Silpat mat or parchment sheet on a cookie sheet, and refrigerate to firm up. I first read about chocolate plastic in a 1984 edition of Chocolatier magazine, and have never made it – but this was the perfect opportunity. 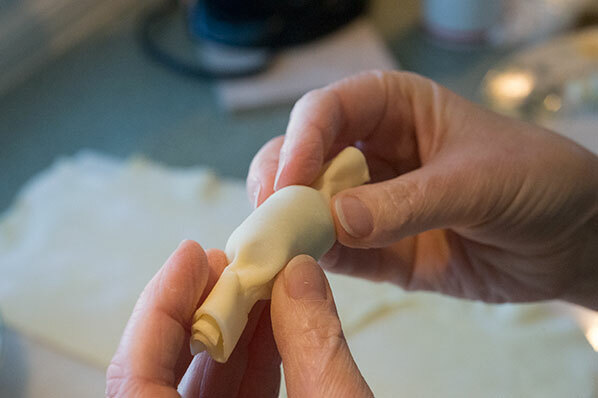 The following recipe, from The Joy of Baking website, resulted in a smooth pliable fondant-like chocolate, that molded well around the ganache “innards”, and was lots of fun to play with. Melt the chocolate in a double boiler or metal bowl set over a pan of simmering water. Stir the chocolate until melted and smooth. Remove from heat and stir until smooth and cooled a bit. Stir in the corn syrup. The chocolate will stiffen almost immediately. Stir until completely combined. Transfer the chocolate to a sturdy plastic freezer bag and refrigerate until firm (about two hours). When the dough is firm, remove from the refrigerator, and knead it until it is soft enough to work with. 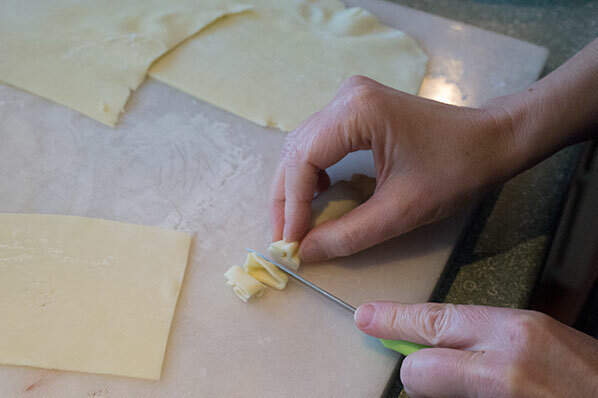 If it is too hard, cut off small pieces, and knead until pliable. Grease the counter where you are working with oil or spray with Pam so the chocolate won’t stick. It’s a bit like working with fondant. I found I didn’t need to chill the chocolate/corn syrup mixture for two hours – it came together quite quickly and was easy to knead. 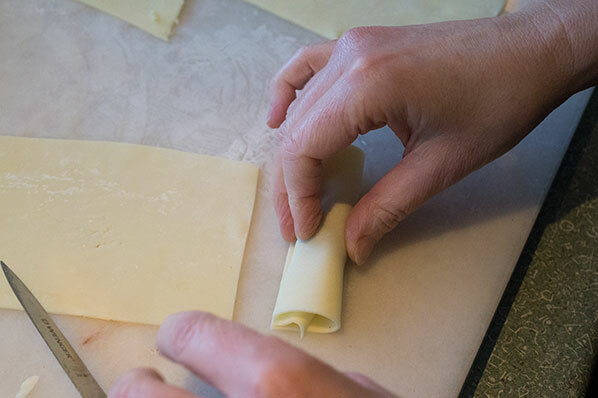 I broke off small bits, rolled them into rectangles, and molded them around the haggis ganache centres, pinching in, then fluting out the ends, as shown.